Drop a handful of our Bath Salts into your tub under running water, and let their soothing scents help you escape from your hectic day. Your own personal spa experience at home! 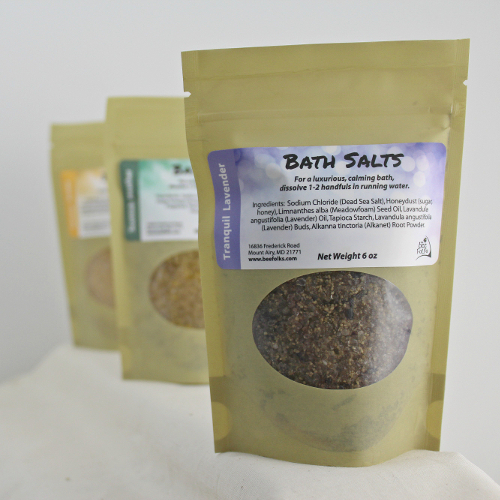 Like the rest of our beauty products, our Bath Salts are made with at least 99% natural products. We carefully ensure only mineral or herbal colorants are used. Dead Sea Salts - The Dead Sea has a greater concentration (than sea water) of certain salts such as magnesium, potassium, and bromides. Magnesium combats stress and fluid retention, and calms the nervous system. Potassium helps to balance skin moisture. Bromides ease muscle stiffness. Honey Dust - helps to soften skin. Meadowfoam Seed Oil - Moisturizes, absorbs well into the skin, leaves the skin feeling soft and silky. Tapioca Starch - Helps the salts retain their scent until dissolved in the tub, then leaves the water feeling nice and soft.